Order Beaverdale Chardonnay 6 bottle from the Stirling Homebrew Shop UK. 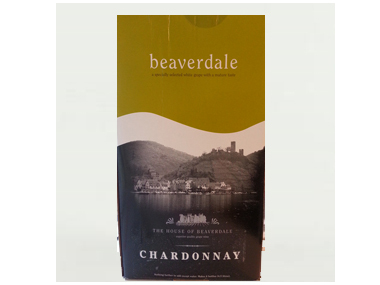 Buy Beaverdale Chardonnay - 6 bottle and other Wine Kits safely online in the UK. House of Beaverdale is a pure grape concentrate of such high quality that it allows people to produce fine wines in their own homes. White wine kit. House of Beaverdale is a pure grape concentrate of such high quality that it allows people to produce fine wines in their own homes, in a range of wines to rival those produced professionally in the Chateaux of the world's greatest wine producing regions. In order to achieve this we use single grape, or grapes from an area like Rioja. The grapes are carefully balanced with sugars to maintain the very highest standards of consistency and quality. Like all grape wines, the House of Beaverdale will improve with keeping, but we firmly believe that even within a week of the wine being finished, you will be absolutely delighted with the taste. If, however, a few bottles from each batch can be laid down, they will have a chance to mature perfectly. The six bottle size has one and a half litres of concentrate, the 30 bottle size has seven and a half litres of concentrate. All have yeast, stabiliser and finings and are perfect for a beginner who is looking for quality wine. All Beaverdale wine kits come with the necessary chemicals. Our UK Homebrew Shop sells real Beaverdale and other Wine Kits safely online to customers throughout the United Kingdom in England, Wales, Scotland and Northern-Ireland. View more products on the Stirling Homebrew Shop from Beaverdale. Where to buy Beaverdale Chardonnay 6 bottle safely online? Shop at the Stirling Homebrew Shop if you are wondering where you can buy Beaverdale Chardonnay - 6 bottle safely online in the United Kingdom. Chardonnay 6 bottle - Beaverdale Chardonnay - 6 bottle in Wine Kits and Homebrew.